It is implied from many references, from leading biologist's, and mathematicians: 'that evolution has (often) found fractal ways, or has used fractal ways'. This is totally misleading. Evolution is a feature of the fractal. Evolution is always, and everywhere, fractal. then evolution is a (universal) fractal process, and can be demonstrated in the fractal - it is a law of the fractal. Evolution is a record of the chaotic or 'different' component of the fractal definition; where the object in question is the 'same' component, and time is the scale. Evolution can been seen in the fractal and is a core component of the mechanics of the fractal: a universal repeating pattern or algorithm. 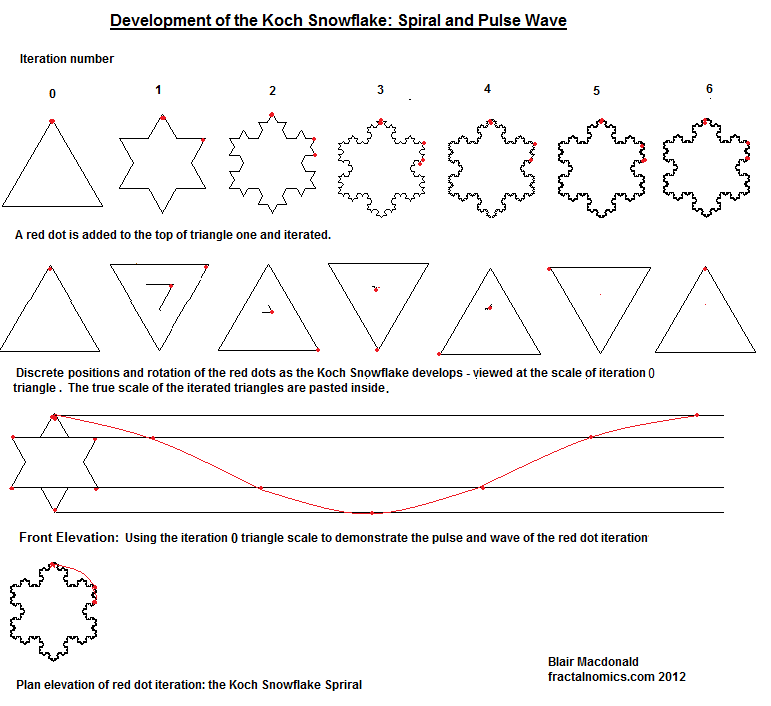 From the simple to the complex, an emergence, as demonstrated in the following 'development' of the koch snowflake fractal. In principle, as the fractal is infinite, so to is evolution. Development may be seen as a 'short run' or short term observation - the development or emergence of an object, from iteration 1, in the fractal, to fractal equilibrium - iteration 6: the development of a tree for example. Evolution may be seen as a long run observation, tracing 'development' of the object, the tree, through (greater) time, and is best demonstrated by the fractal zoom. Evolution shows the 'chaos' the complexity or the influences on the 'developed' object. Evolution and development are, fractaly speaking, of the same principle, and may well be indistinguishable from each other without a (time) scale reference. The tree, becomes the tree of life. 'Nested' development within evolution. The fossil record traces or records these changes through time - the fossil record is a fractal record: 'cataloging' the infinity of ('different') combinations. Can, in the long run, something become fully evolved, as we can say something can be fully developed? Yes, and no. In the same way as there are limits to (fractal) growth and development, the object will evolve to a formed shape; but no, because there will always be change, an infinity of changes - never one object the same. From an analysis of the fractal, we can see that evolution and quantum mechanics are related. More to come. The below diagram(s) demonstrate a change to one of the triangles during the development of the fractal. A pulse, or wave is demonstrated - is evolution a wave phenomena? Branching is also demonstrated, which is key to evolution. I am very interested in Biology, particularly the fossil record: here is one of my favourite lectures where the only word left out is fractility. Here the Professor describes key principles of economics at the smallest of scales. It is worth a listen. Professor Rainey paints a picture of life's evolution from the perspective of major evolutionary transitions, including that from solitary organisms to societies.